Today, a Ferrari 458 Spider was cruising around Tokyo's geek district, Akihabara. Things got freaky. This was a stunt for popular anime Attack on Titan, which features human-eating giants. The point was to draw a crowd and end up on the internet. Mission accomplished! 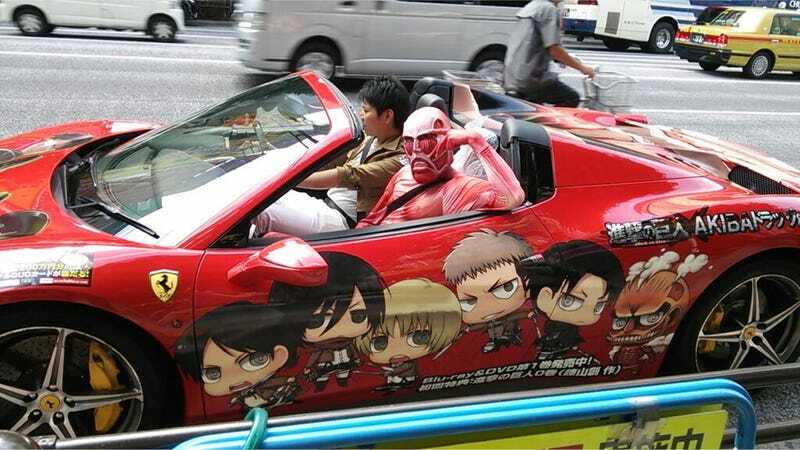 The itasha (痛車) anime stickers, however, weren't the horrifying part. Or the poses the cosplayer was striking. No, it was something the cosplayer was wearing. OH MY GOODNESS. CROCS, NO, NO, NOOOOOOOOOO!!! While Crocs might be loathed by many, people in Japan, especially kids, continue to wear them. Perhaps they're ideal for a country in which you're always taking off your shoes. If you are worried about the car (and really, you should be), fret not. The decals come off. Ditto for the Crocs.